This is the first series on Tropical Spider. Not the best photo but the only one that is clear. The rest of the photos are either blurred or out-of-focus. The background are the flower pots. 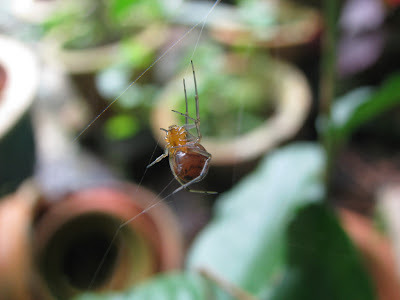 It was a difficult shot as the spider is so tiny and it keep moving. Macro shot is not easy if the object is tiny as the camera processing logic seems to focus better on larger object or better coloured object. Rest assure, there will be more series on Tropical Spider. Keep visiting this blog for updates. Insects are so difficult to photograph.